Letting go is an emotional and spiritual surrender. It means willingly jumping out of the lifeboat of your preconceptions of reality and taking your chances out in the open sea of anything-can-happen. It means that even as your definition of reality is dissolving before your very eyes, you willingly relinquish it, instinctively comprehending that the state of surrender itself will be a creative condition. It’s hard to let go, to live in a formless, destinationless place. All our lives we’re taught to hold on, to be the masters of our fate, the captains of our souls. 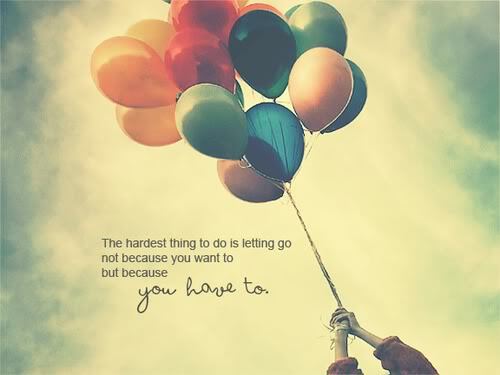 Letting go isn’t comfortable; it can feel like anything from laziness to utter loss of control. It’s not aggressive and self-assured. It’s not the American way. But letting go is, in truth, is a most elegant kind of daring. It is vulnerability of the highest order, an emptying out of self, of all the clutter, chatter, ideas, attitudes, schemes, and plans that, ordinarily, we all contain. In this emptiness, there is room for so much; in this vacancy, anything can happen: breathtaking transformations, changes of directions, miracles that will purely astound you, love that comes out of a spiritual conversion. But only if you are willing to truly let go of it all: as the tree dropping her bright leaves for winter, the trapeze artist, suspended in midair between two bars, the diver free-falling from the high dive, have all unequivocally, wholeheartedly let go. Letting go is being alive to the power of anything is possible. It is living in surrender, trust, and the belief that emptiness is at once the perfect completion and the perfect beginning. So let go. And remember that if you hang on to even a shred or try to make a deal with Gods meaning of letting go you might not experience all the wonderful things that are ment happen to you.